Brand new apartment fully equipped (wifi), amazing sea views . Very quiet near an olive tree park, ideal to relax , private pool and terrace.10 minutes walk from the beach. Situated within a very well maintained and secured residential complex. This very cozy holiday apartment is situated near Benalmádena Pueblo (300 m. above the sea), a typical Andalusian little white village with whitewashed houses, narrow steep street and some of the best sea views of the Costa Del Sol. Often on the evenings we can see Gibraltar and Africa coast line from the terrace. It's a very nice apartment for 4 persons with one real bed and one large Sofa bed. Total surface available 150 m2 (apart + private pool and terrace). If you do not want to rent a car, as a service, we can get and drop you right at the airport for 60€ (30€ each way). Renting a car is recommended but not mandatory as the train station is 10 minutes away. - Golf, Many great Golf course on the Costa Del Sol also called "la Costa Del Golf"! Just ask me and I let you know all the best spots! I'm Swiss and I've been living here in Benalmádena pueblo for 10 years now. I lived around the world and this is the place where I dropped my luggages because it correspond to what I am. Wonderful private residence with some of the most beautiful sea views of the Costa Del Sol. International airport 15 min away. Train station 10 minutes walk away. Between Málaga and Marbella. I really enjoy this region and local atmosphere and people. 300 days of sun changes the whole life game. 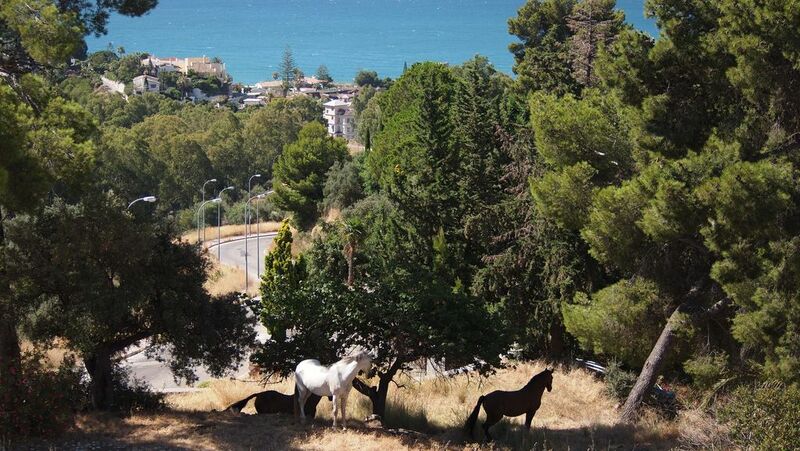 180 degrees sea views all year long with a wonderful and typical Andalusian olive tree park. Just above, one of the beautiful Andalusian white villages, Benalmadena. Benalmádena is a wonderful Andalusian white village 300 m above the sea. Great restaurants an local life style all year long. 180 degrees view on the Mediterranean sea above a beautiful olive tree park. It's a typical Andalusian view with little chapel. Vue à 180 deg. sur la Méditerranée, surplombant un parc d'oliviers magnifique. C'est une vue typique de l'Andalousie avec la chapelle, les oliviers et la mer. The private pool on the terrace nearby your apartment is reserved just for you. The community pool is opened mainly from June to September and is reserved for the urbanization clients. A lot of activities are available in this region like water sports (kitesurf, windsurf, paddle, yoga, hiking, river walks, and more ...) Typical Andalusian village visits, mountain climbing or trek. Please ask me for more information. We had a wonderful time in this gorgeous property. The property was beautifully clean, extremely comfortable with great space in and out. It had everything you need for a great stay. Tita and Jim were great hosts. Wish we could have stayed longer. Vacances exceptionnelle avec des hôtes exceptionnelle. Merci et à très bientôt j'espère. Das Appartment ist wirklich sehr schön, sauber und modern eingerichtet. Der Pool ist deutlich größer als erwartet und die Terasse ist sehr großzügig mit einem super Meerblick. Außerdem sind die Vermieter sehr nett und geben auch gerne Tipps für die Gegend. Wir würden das Appartment immer wieder buchen. Et que dire des propriétaires qui sont adorables , toujours à l'écoute , toujours souriants, prenant le temps d expliquer les bons coins à aller visiter.